Performers include: Robert Hays, John Reilly, Jennifer Hale, Ed Gilbert, Katherine Moffat, Jim Cummings, Dorian Harewood, Casey Defranco, Linda Holdahl, Tom Kane, James Warwick, Neil Dickson, James Avery, Tony Steedman, Chuck McCann, Neil Ross, Robert Ito, Philip Abbott, and Efrem Zimbaliast Jr. Billionaire industrialist and technology expert Tony Stark (Robert Hays) is kidnapped by the evil Mandarin (Ed Gilbert, later Robert Ito) and held in a Himalayan fortress. While being forced to create weapons for his captor, Stark is injured and shards of metal threaten to injure his spine and leave him paralyzed. He uses his expertise to create a solar-charged, steel-mesh suit of armor that helps him escape, overcome his injury, and become the superhero known as Iron Man. Intent on obtaining the armored suit, which he believes Stark had a hand in creating, Mandarin attempts to lure Iron Man into elaborate traps. He leads a group of villains including Blacklash (Dorian Harewood), Dreadknight (Neil Dickson), Hypnotia (Linda Holdahl), Blizzard (Chuck McCann), Grey Gargoyle (Dorian Harewood), Living Laser (Robert Hays), M.O.D.O.K. (Jim Cummings), Whirlwind (Dorian Harewood), and Justin Hammer (Tony Steedman, later Efrem Zimbalist, Jr.). In his guise of Iron Man, Stark leads a group of heroes known as Force Works, including Century (James Warwick, later Tom Kane), War Machine (Jim Cummings, later Dorian Harewood), Scarlet Witch (Jennifer Darling), Hawkeye (John Reilly), and Spider Woman (Casey Defranco, later Jennifer Hale). 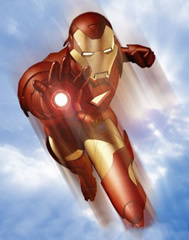 An animated series based on Marvel’s popular Iron Man comic series.